ST. PAUL, Minnesota (CNN) -- On the eve of the Republican convention, a new national poll suggests the race for the White House remains even. Sens. 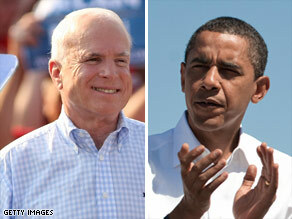 Barack Obama and John McCain are in a virtual tie, according to the latest poll. A CNN/Opinion Research Corp. poll released Sunday night shows the Obama-Biden ticket leading the McCain-Palin ticket by one point, 49 percent to 48 percent, within the statistical margin of error. The survey was conducted Friday through Sunday, after both the conclusion of the Democratic convention and Sen. John McCain's selection of Alaska Gov. Sarah Palin as his running mate. A previous CNN poll, taken just one week earlier, suggested the race between McCain, R-Arizona, and Sen. Barack Obama, D-Illinois, was tied at 47 percent each. "The convention and particularly Obama's speech seems to be well-received. And the selection of Sarah Palin as the GOP running mate, also seems to be well-received. So why is the race still a virtual tie? Probably because the two events created equal and opposite bounces assuming that either one created a bounce at all," says CNN Polling Director Keating Holland. Obama's acceptance speech in front of a crowd of more than 80,000 people at INVESCO Field in Denver, Colorado, on Thursday night wrapped up the Democrats' convention. It was one of the most widely watched political conventions in history. The poll suggests that the convention made people who watched more likely to vote for the Democratic ticket. Fifty-one percent of registered voters said the convention made them more likely to support Obama; only 32 percent said they were less likely to back the Democratic nominee. Less than 12 hours after Obama accepted the Democratic presidential nomination, McCain introduced Palin as running mate, surprising the political world. So far, according to the poll, 4 in 10 Americans are not familiar with Palin; 38 percent of those questioned viewed her favorably and 21 percent unfavorably. Men appear to have a slightly more favorable opinion of Palin than women; 41 percent of men view her favorably, five points higher than women. Americans seem evenly divided on whether McCain made a wise choice in selecting Alaska's first term governor, who's been in office for less than two years. Fifty-two percent rate the selection of Palin as excellent or pretty good; 46 percent rate it as fair or poor. Is Palin qualified to be president? Fifty percent say she's not qualified to assume the presidency if that becomes necessary; 45 percent say she is qualified. In recent history, the only running mate to earn less confidence from the public was Vice President Dan Quayle in 1992. Ultimately however, the Palin pick may have minimal effect on the race for the White House. Almost 6 in 10 Americans say Palin's selection as McCain's running mate will have no effect on their vote. One in five say it makes them more likely to vote for McCain; one in five say it makes them less likely. Three quarters of all voters think McCain chose a female running mate specifically because he thought adding a woman to the Republican ticket would help him win in November. "If McCain was hoping to boost his share of the women's vote, it didn't work," Holland said. "Women now appear slightly more likely to vote for Obama than they did a week ago, 53 percent now, compared to 50 percent. But McCain picked up a couple of points among men. "More important, McCain solidified his party's base with the Palin selection, dropping Obama's share of the Republican vote six points to just 5 percent now. The Palin selection did not help among women -- that may come later -- but it did appeal to Republican loyalists." The CNN/Opinion Research Corp. Poll was conducted Friday through Sunday, with 927 registered voters questioned by telephone. The survey's overall sampling error is plus or minus 3 percentage points.